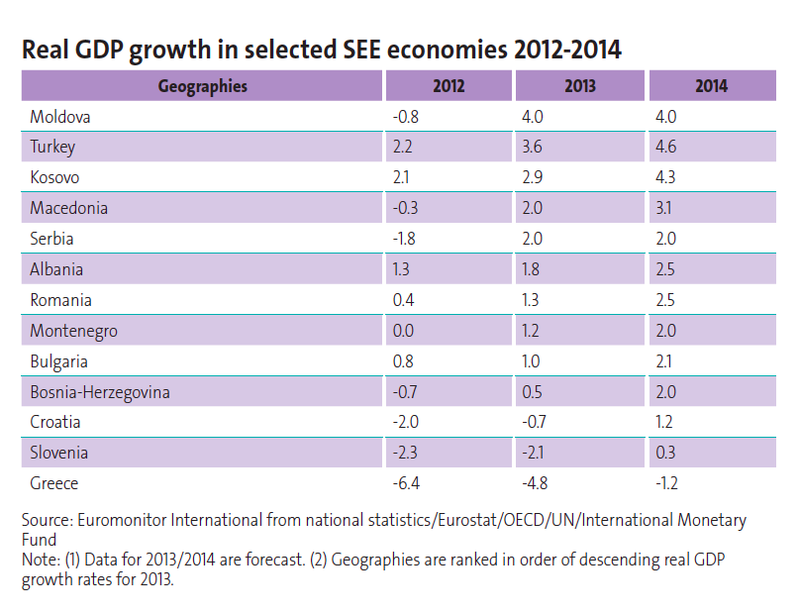 The global economic slowdown of 2012 was far sharper than expected and its impact on the economies of Southeast Europe turned the spotlight on the region’s structural weaknesses whilst also exacerbating the effects of the eurozone debt crisis. For these economies, 2013 is a year of readjustment and renewing commitments to creating robust and sustainable economic growth, an approach which is forecast to result in more promising rates of real output in 2014.
in fortune in 2013, going from real growth of -0.8% in 2012 to 2.0% in 2013. The country’s industrial production index is still below 2005 levels in 2013, thanks mainly to supply bottlenecks while unemployment is high at 16.9%. However, this stagnation is showing signs of receding as inflation levels ease and its automotive exports boost growth prospects. The country’s proximity to Croatia will also be a boon to the Serbian economy which, in turn, will also help the Serbian EU accession process in the mid to long-term. Whilst some of the emerging SEE economies are already starting to come out of the other side of the slowdown caused by the eurozone debt crisis, some are still struggling with deep recessions, unstable financial systems and lack of privatisation dragging on potential investment levels. In this group, it is the EU members who are the worst affected. The overall macroeconomic outlook for this region in 2013 is still relatively poor but in the mid to long term it does look more promising. It’s easy to forget how far these countries have come in the last twenty years in terms of economic and political stability so challenges associated with opening up to trade, increasing productivity, developing social safety nets and generally building credible institutions are to be expected. The next few years will see these countries, particularly the “Balkan 6” gaining greater access to the free market in preparation for EU accession whilst also building on their fiscal achievements to ensure macroeconomic stability, strong business environments and rising consumer incomes.